The unification ministry on Wednesday put off a decision on whether to allow businesspeople to visit a shuttered inter-Korean industrial complex in North Korea, after the United States reacted negatively to the possibility of resuming such economic projects with Pyongyang. Last week, 179 people asked for government permission for their visit the factory park in the North's border town of Kaesong to check the equipment and facilities they left behind when the complex was closed in 2016 amid nuclear and missile tensions. The request came after the government said it will consider restarting the Kaesong complex and a long-suspended tour program to the North's Mount Kumgang as a way to facilitate negotiations between the US and the North following the no-deal breakdown of their second summit last month. But the US has since reacted negatively to the idea, with a senior State Department official flatly saying, "No," when asked if Washington is willing to consider waiving sanctions for a possible resumption of the Kaesong and Mount Kumgang projects. "We are supposed to complete our review by tomorrow but a decision has yet to be made," Baik Tae-hyun, the ministry's spokesman, said of the businesspeople's request to travel to Kaesong. "We currently plan to extend the review period until March 22." 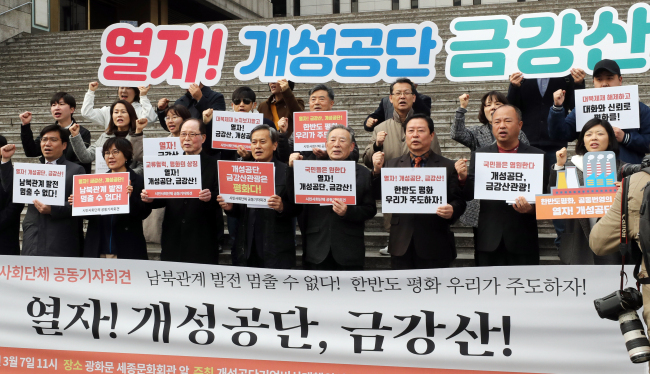 It is the eighth attempt by the businesspeople to visit the Kaesong industrial park since Seoul shut it down in 2016. Their previous requests had been denied on apparent concerns that their trip to the North could send the wrong signal that sanctions would be eased to resume the operation of the complex. Earlier, the ministry said that it is possible to allow them to visit the industrial complex within the framework of global sanctions and that it will seek consultations with the US on the matter. South Korean President Moon Jae-in and North Korean leader Kim Jong-un agreed in September to resume the operation of the Kaesong park and tours to Mount Kumgang on the North's east coast when conditions are met. South Korea had hoped that the summit between Kim and US President Donald Trump last month would be successful and lead to eased sanctions, providing more leeway for Seoul to push for such joint projects. But it produced no deal, clouding the outlook for cross-border cooperation. Meanwhile, the spokesman said that the government will discuss a sanctions waiver with the US for video calls that it is pushing to hold for families separated by the 1950-53 Korean War. Officials of South Korea and the US will discuss the issue through a working group session in Washington on Thursday (local time), he said. The allies established the working group meeting last November to exchange views on North Korea. The UN Security Council recently approved a sanctions exemption for equipment to be sent to the North for video reunions. Seoul also requires sanctions exemptions from Washington in order to hold such an event.